Georgia and Venezuela witnessed landmark elections in early October. Feodor Lukyanov analyzes two opposing positions in today's ideological and political system. Two different parts of the world witnessed landmark elections during the first week of October. In Georgia, President Mikhail Saakashvili’s party lost the elections, while, in Venezuela, Hugo Chavez retained his post as head of the government. 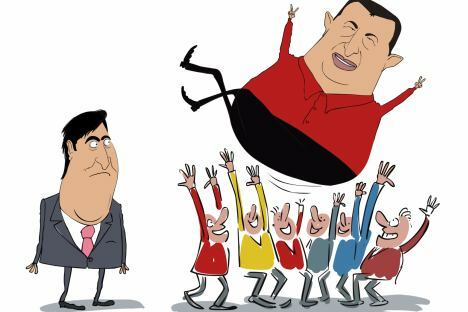 Saakashvili and Chavez may be similar in character and temperament, but their outlooks and agendas are exact opposites. They make up two opposite poles of today’s ideological and political system. What unites the presidents of both Georgia and Venezuela is their unshakeable certainty in the rectitude of their actions. Neither is an opportunistic pragmatist – both are ideological politicians. Saakashvili is as zealously engrossed in privatization and economic deregulation as Chavez is in nationalization and placing matters under state control. Both men are certain that the only viable kind of government, in times of transformation, is an authoritarian government with formal and informal power concentrated in the hands of a single leader. Nor do they doubt that, to complete their historic mission, they must enjoy protracted rule – lest such a backbreaking task go unfinished. Each thrives on having a powerful enemy – Russia in one case, the United States in the other – in a confrontation that justifies the measures they take. Each also has a reliable foreign ally (the same two countries, but the other way round) which helps bolster resources, including military capabilities. Saakashvili and Chavez view themselves – and their countries – as no mere run-of-the-mill players on the world scene, but as flagships that set the course for others too. This accounts for their propensity for regional leadership in the Caucasus and in South America, respectively. Lastly, both the former lieutenant-colonel and the American-certified lawyer rely, to an equal degree, on charisma to generate support. Saakashvili is a hardline reformer of Bolshevist tendencies, who has no interest in reworking the economy or the apparatus of government, or even the structure of society – he wants to change the people themselves. Georgians, he suggests, must be compelled to live and work like “normal” Europeans, and weaned off paternalism and dependency. Unable to develop the popularity of such steps, Saakashvili addresses a minority instead – the young and energetic, untainted by “malicious” traditions – that will build a new Georgia, in which every citizen relies on themselves. But the true inspiration comes not from within, but without. It comes from the nations who are worthy of imitation. Chavez’s power-base is the majority to whom he promises care and equality in a potentially wealthy country, which had always been intensely stratified. State paternalism and a system of fair redistribution are his creeds; both are committed to continued support for society’s poor. Sooner or later, account must be made of the actual results – the number of people disillusioned with the lack of dynamism will grow. But this has yet to be seen in election results. Diametrically opposed in attitude, Saakashvili and Chavez nevertheless have some important things in common. Both have positioned themselves against the traditional establishment. The “People’s President” of Venezuela represents the needy and disadvantaged against a wealthy aristocracy, which has always treated others with unconcealed contempt. The leader of the “Rose Revolution” in Georgia, despite his own privileged origins, began to fracture the accepted social order and pull the rug from under the elite, in every sense of the word. Chavez has demonized the Venezuelan “bourgeoisie” – not just the ousted aristocrats, but also a burgeoning middle class that has no need for a stifling caretaker state. Saakashvili stacked up many enemies amid the ranks of the famous Georgian intelligentsia, who have been incensed by his flagrant disdain. For all this, however, the Venezuelan commander still has a large number of supporters, while the Georgian leader has fallen out of favor not only with the former Tbilisi high-flyers, but also with the section of the populace that has gained nothing from his swingeing reforms. Chavez, whom many would call a near-dictator, is actually a committed supporter of democracy, in which he feels the support of the masses. By contrast, Saakashvili, who has extensively promoted his slogan “the torch of democracy, believes that only authoritarian leadership can coerce the majority into modernization. Neither one nor the other has succeeded in establishing a firm footing, although their careers are not yet over. Chavez remains, and Saakashvili could well return – the latter would have to start from scratch in many areas. In summing up their achievements, the conclusion is banal. All overt divisions of society lead to precipitous imbalance, whether the government relies on the silent majority, or the vocal minority. Both these components of society are equally needed for robust legitimacy to thrive; this is the key to success in today’s chaotic world. Fyoodor Lukyanov is Editor-in-Chief Chief of Russia in Global Affairs. First published in Russian in Rossiyaskaya Gazeta.